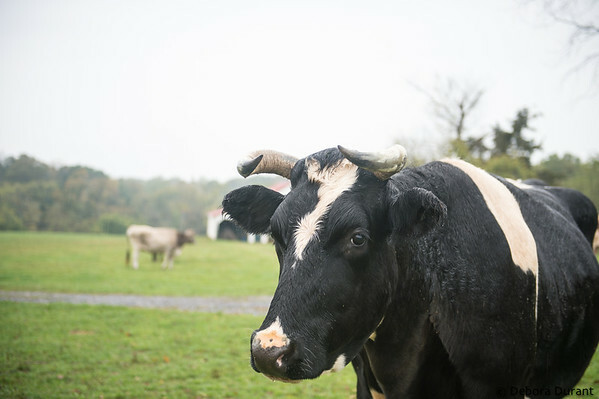 I think that all of us involved in the sanctuary‘s Open House spent last week anxiously watching the weather reports for Sunday. 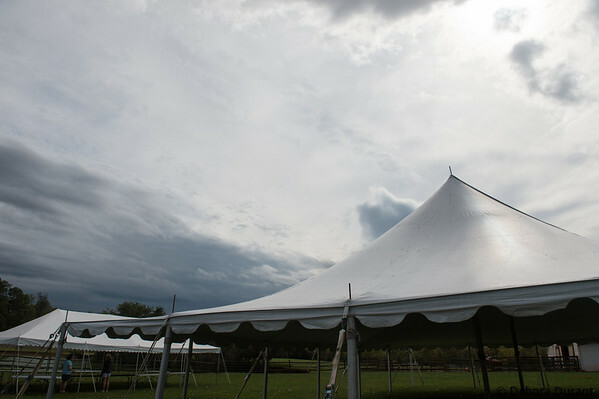 It seemed that every day the forecast was more grim – colder, wetter, and all around worse for an outdoor no-rain-date event that is also the biggest fundraiser of the year. By the time Saturday came – gorgeous, warm, blue skies and sunny (at least part of the time!) 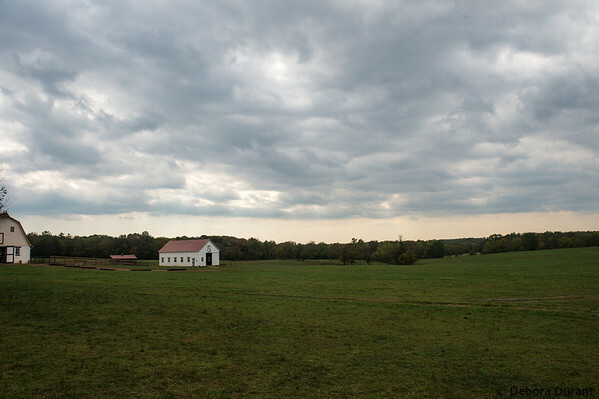 – it was clear that Sunday was going to be 25 degrees colder, and that there was no chance of a dry day. Terry and Dave had rented an extra tent to cover where the speaker and audience would be, and for the Silent Auction tables that are usually just outside the Silent Auction tent. Extra tent. Silent Auction tent off to the left. 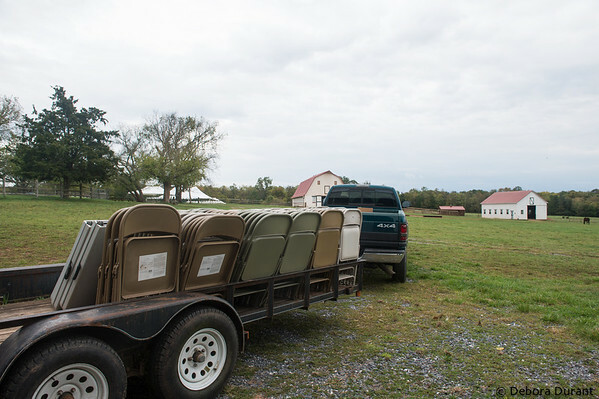 We only pulled out about half the usual number of chairs, and we had a good crew to help with the set up after chores on Saturday, so that wasn’t as painful as it usually is! 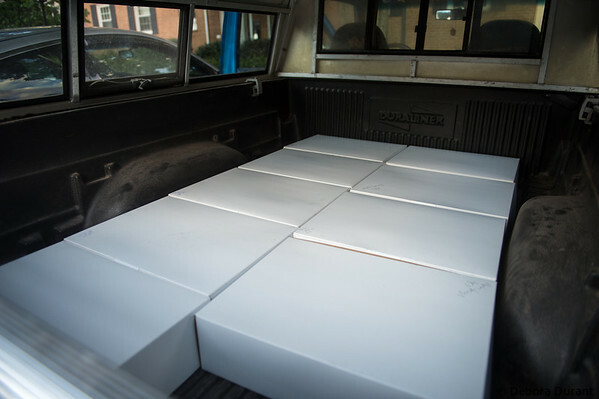 After set up, I headed into DC to pick up a few hundred pounds of cake from Sticky Fingers. Cake is heavier than you’d think! 4.5 sheets fits just fine in my little truck. We still had hope that there wouldn’t be rain during the actual event, or that any rain would be more of a drizzle than a downpour. And that’s exactly what we got. It was cold, and it rained in the morning while we did chores, but a couple hours before the event started the rain dried up, and it stayed dry until after the event, when we were cleaning up. 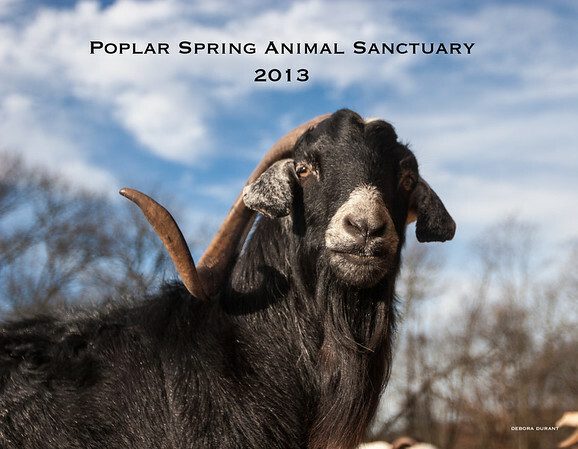 The sanctuary has been lucky for many years, and though this year’s weather wasn’t perfect, it certainly could have been much much worse. Initial attendence estimates are that about half the normal number of people came. Terry had expected worse, so even this was somewhat positive news! I haven’t heard even a rough guestimate on how much was raised. 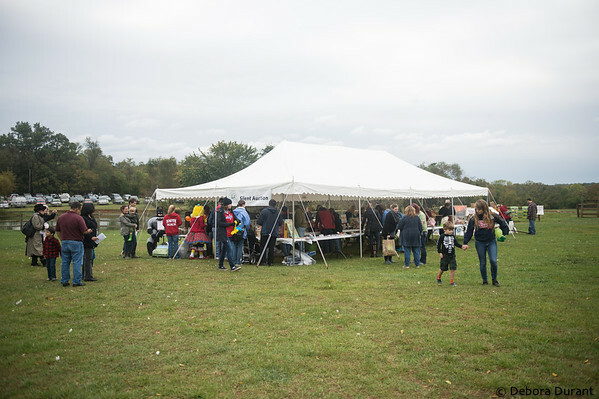 The Silent Auction tent was hopping at the start of the event! The speaker this year was Karen Davis, of UPC. I was down at chickens, so I didn’t even see her, let alone hear her talk, but from what I heard from visitors to the chicken yard, her talk was really good. Maybe someday we’ll start getting good video of the talks so that we can all enjoy them afterward! We brought Harrision down from the playhouse to the chicken yard again. And as usual, he had a great time. He was basically held and snuggled for four solid hours, which is his very favorite thing. 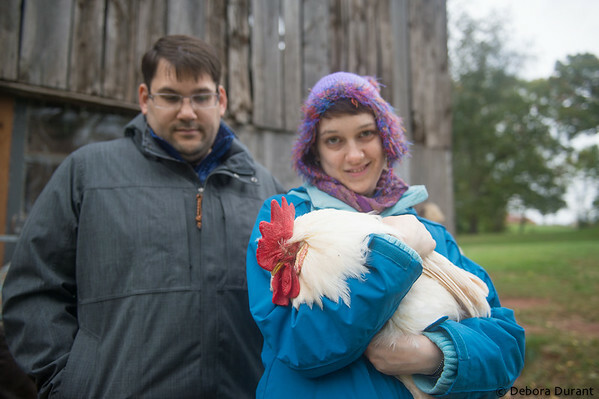 It was great to give people the opportunity to hold him, especially the people who were really uncertain whether they wanted to hold a chicken. They’d be a bit nervous, sometimes they’d ask if he bites. I would always assure them that he was just going to fall asleep as soon as he was in their arms. And as soon as they held him, they fell in love. And then I’d tell them about the Chickendales calendar in the gift shop! At one point one of the young volunteers, Max, came up to me asking if I could try to find someone who didn’t mind being held. 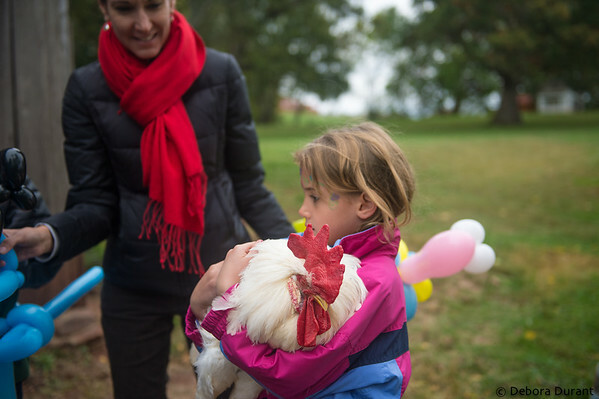 There were people who really wanted to hold a chicken, and the usual suspects (aside from Harrision) were not interested in being held right then. I put him in charge of supervising Harrison and went looking. Like Max, I kept striking out, until I thought of the Japanese Silky boys, Jethro and Horatio. They enjoy being held, and while they don’t usually like being picked up it was late enough in the day that they were starting to head toward their stall in the barn. I got Horatio into the barn, and then was able to grab him. I’d have felt bad about tricking him, except that I knew he would enjoy being held for a while. Liquin and Horatio. He’s a sweetheart! His eyes were half closed as she held him. People tend to love the Silkies. They look so different, so distinct, and it fascinates people. “Is this his comb? He looks fluffy instead of feathered!” He required a bit more care when transferring him to different people, because his tendency is to be a little restless compared to Harrison, but many people got a chance to hold him, and many more pet him as I held him. 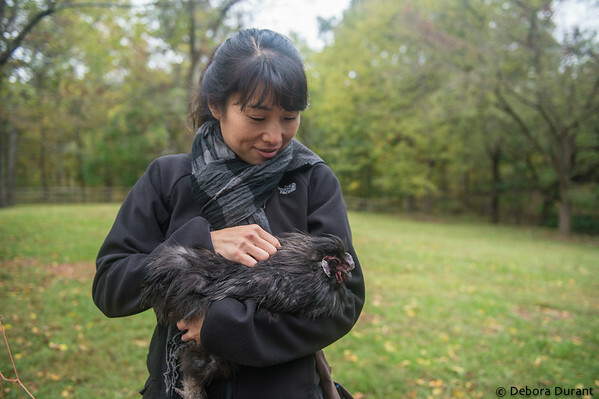 I got some good questions – people wanting to know how you tell a rooster from a hen, and about rooster courtship rituals. 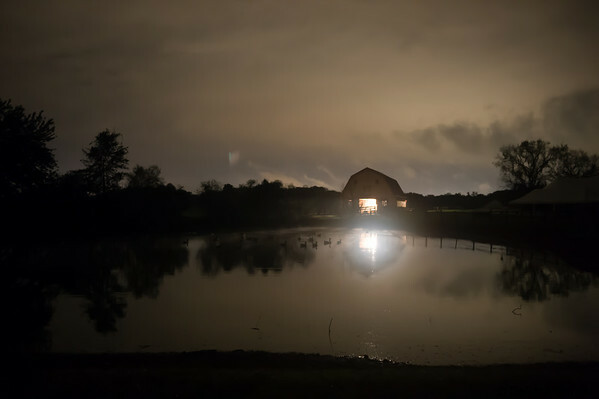 We had a fairly steady crowd – sometime there was a line to hold Harrison, other times there were only a few people down at chickens, but I don’t think there was ever a time when there were no visitors at all. Shannon (aka VeganBurnout) snuggling Harrison, with her husband smiling at them both. I donated a few things to the silent auction. Some canvases, but I’d also had some glass photo cutting boards made, and some photo iPhone covers, and those seemed to be popular as well. I’d ordered them as an experiment, curious what the quality would be like. Good enough, I guess! A friend has donated her expired Canvas On Demand groupons to me, and I’ll be using those to print more canvases to be used in future fundraisers for the sanctuary. There are rumors that we might do another silent auction at the Thanksgiving With The Turkeys event, but otherwise they’ll be in the silent auction at next year’s Open House. Thanks Ida! The calendars were apparently a pretty big hit also. This is the first time in several years that I’ve had them ready in time for the Open House, and it sounds like that was a good thing. October seems early for people to be thinking of the next year’s calendar, but maybe it ends up being the right time. There is currently a really nice coupon on Lulu for ordering them online – 30% off with coupon code “MEMENTO”. (No quotes, but must be all caps.) That coupon is good through October 15, 2012. There will be other coupons later too, but 30% is generally the best you can get, and I don’t know if I could predict whether there will be another 30% off coupon! But if you miss the October 15th deadline for this coupon, you can always check Lulu’s current specials page to see what coupon is active. There are two calendars this year. 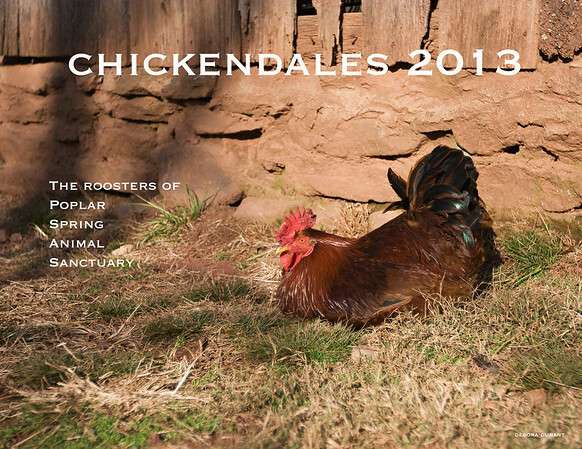 The regular one, with the stories to go with each resident, and new this year is the Chickendales calendar, which has the names of each rooster, but not the stories. You can see the full previews of each calendar on their Lulu page. Oh, I’m glad you like the recaps! I always feel like I’m babbling and boring people. It was great to see you again too! I’m so glad you came out, despite the weather, and had a good time. And got some Harrison AND Horatio snuggles! Yay, you got both calendars! 😀 Hope you enjoy them!